Turns out a mattress in not just a mattress. Just ask the princess from the literary fairy tale, The Princess and the Pea. While comfort was essential to the her, the desire for a good night’s sleep certainly shouldn’t be limited to royalty. A tiny pea wedged deep in a pile of mattresses isn’t exactly attributed to today’s sleep issues. However, back support, firmness with comfort, stability, breathability and quality materials sure are. 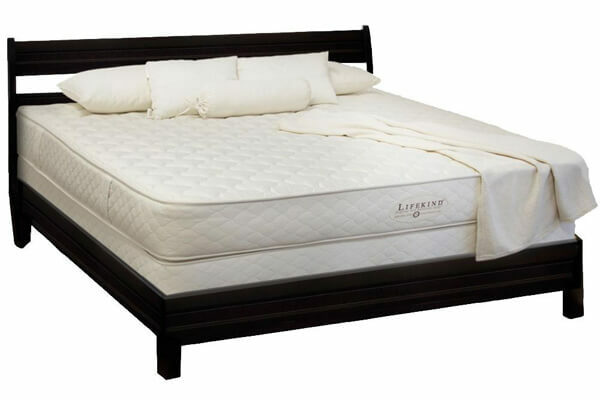 After all, we spend one third of our lives in the bedroom, making a mattress purchase of utmost importance. 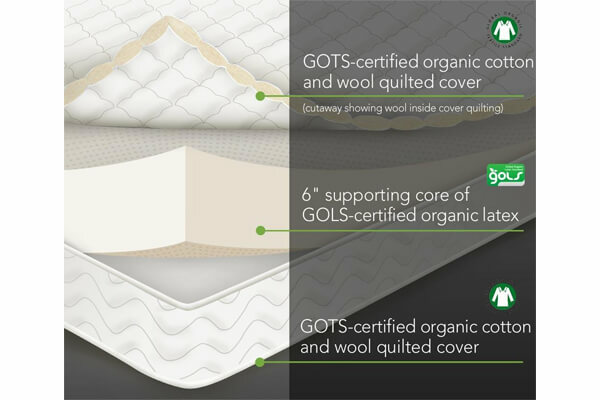 Why Choose a Certified Organic Mattress? How do you know who to trust when investing in one of the most important household purchasing decisions? Even many eco-friendly or green mattresses fail to actually live up to their hype and use uncertified claims to confuse – or in this case – greenwash – you into spending money on a mattress that may not be all it’s cracked up to be. Does it really matter? The Environmental Working Group (EWG) tested the umbilical cord blood from newborns in the United States. The results were shocking. Scientists discovered 287 chemicals, on average, in the samples tested. According to the EWG, the contamination includes “Everything from consumer product ingredients like Teflon and Scotch-guard to flame retardants and fragrances to waste that comes from burning gasoline and garbage.” Yes, humans are being born pre-polluted. Therefore, limiting our daily exposures to hazardous chemical ingredients in our homes, our air, our water – and our bedding – is essential today, for you, your family and our precious planet. 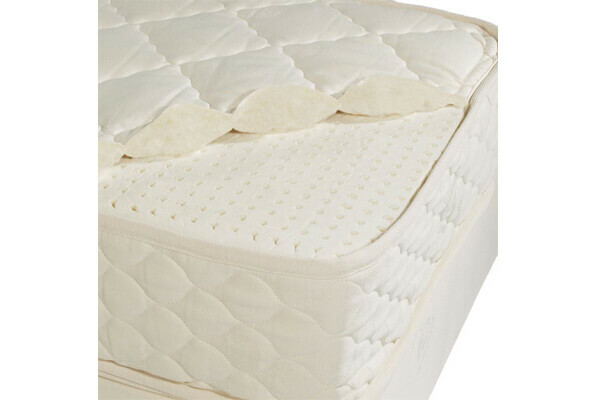 Organic mattresses don’t off gas hazardous chemicals that affect human health. The certified organic materials from which they’re made don’t tax the earth’s resources, and are responsible for infinitely less pollution than polyester, pesticide-treated cotton, chemical flame retardants, or memory foam. Lifekind Inc. is America’s most-trusted, organic lifestyle brand for the whole home offering certified organic mattresses and bedding, made at their very own, California-based Eco-Factory™. Founded in 1997, Lifekind is available online (and at retail), ensuring quality and time-tested organic products are available to the now many educated and concerned consumers seeking to reduce their chemical exposure. Lifekind products are free from the many chemicals found in synthetic and conventional products, to help you reduce your daily chemical exposure. Good news! 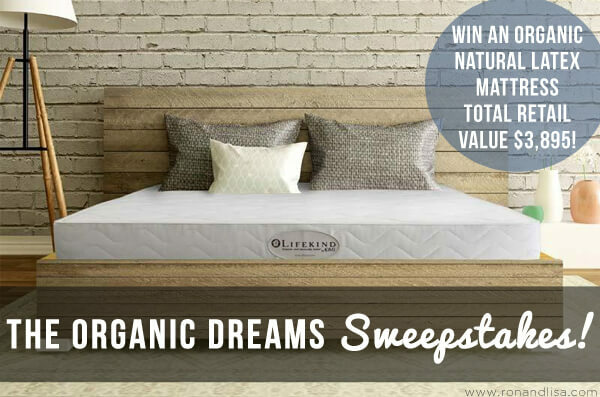 We’re offering you a chance to win a top of the line certified organic mattress – The Euro — Certified Organic Natural Rubber Latex Mattress (Queen sized) from Lifekind. Retail value $3,895.00 Click below to enter (and share with a friend or loved one who could benefit from a healthy and happy night’s sleep). Sweepstakes open to residents of the United States. Ends 12/18/18. 2. GOTS Certified Organic Cotton FabricsLifekind’s unbleached, GOTS certified organic cotton knit and woven fabrics are made from the highest quality, organic cotton fiber available, and are never chemically treated. Sourced from New Zealand, farmers adhere to strict standards to assure the certified purity of the GOTS fibers. Organic pastures and grazing grounds, minimal processing and humane shearing practices contribute to the organic standard, to certify the wool. Lifekind’s products meet UL’s highest standard for low emissions, VOCs and pollutants, to help ensure indoor air quality and contribute to a healthy home environment. Lifekind products even qualify for LEED credits, and are certified safe for use in schools and for children. We know you’ll love your Lifekind mattress, and the peeps at Lifekind agree. In fact, they’re so confident that, in the unlikely event you are at all uncomfortable, just contact their customer service for a consultation and to arrange for a one-time exchange. Lifekind offers a generous 90 days from the date of delivery to request a comfort exchange, after you’ve slept on your new mattress for at least 15 nights. Now that’s putting their money where their mouth is! Lifekind has been producing its certified organic mattresses and bedding, and other organic textile products at its California-based Eco-Factory™ since 2003. The first certified organic mattress in America was made here, after a Lifekind mattress became the first to pass Federal flammability standards without the use of hazardous chemical flame retardants. Whoop! Their product line is vast and included non-metal, organic latex mattresses, foundations, pet beds, crib mattresses, linens, toppers, pads, pillows, bath and towels as well as nontoxic personal and household care. It’s basically a one-stop shop to create a truly healthy haven. Would sureembrace a chance to try this innovative mattress!